There’s a lot that goes into making a home special, and many people put all their attention into choosing furniture and paint colors. But one of the things that can take a home from builder’s grade to truly unique is personalizing your home with hardware and trim. This is one of the areas that separates the ordinary from the exceptional, and details can be added over time as your budget allows. 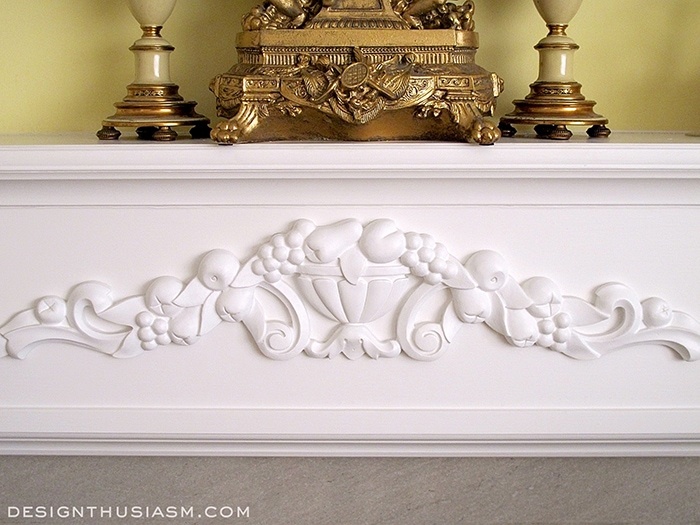 A great place to start is with crown moldings, like dentil or egg and dart, pictured above. In my home, we also took care in selecting rods for our window coverings that had the character of our room design. The finials here evoke a sense of European elegance that sits comfortably with our French country decor. 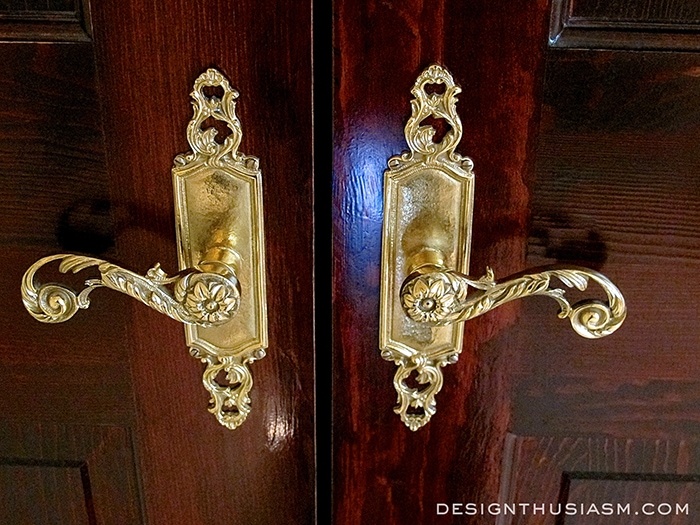 Decorative brass door handles work well against these mahogany stained closet doors. They’re the first thing you see when you enter my front door and become a focal point in the entry foyer, setting the tone for the house. Architectural woodcarvings can be added to various flat surfaces, lending a delightful flourish to your trim. We added this one from Enkeboll Designs to our fireplace mantel for a playful yet pretty touch. I’m one of the few people who can get all excited about a shower door handle, but it’s one of my favorite details in our master bath. Yes, we could have easily gone with the plain curved one that you see everywhere, but I like for everything to look like it was designed with care. Another one of my favorite trim details is our wood tie backs in the dining room. 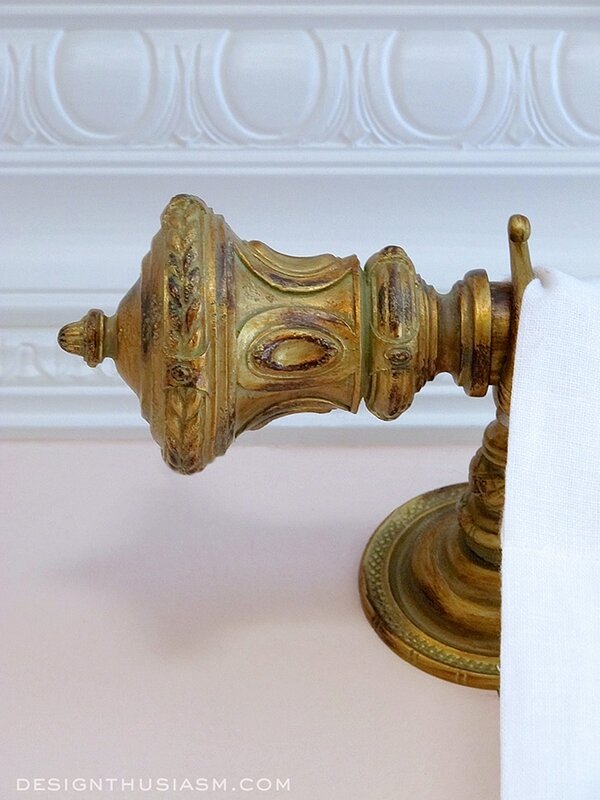 They were stained to match the rod finials with a distressed gilded finish. In the living room we carried through the grape leaf theme that you saw on the mantel carving, with chunky finials in a gold tone finish. Our front door handle is an aged brass. 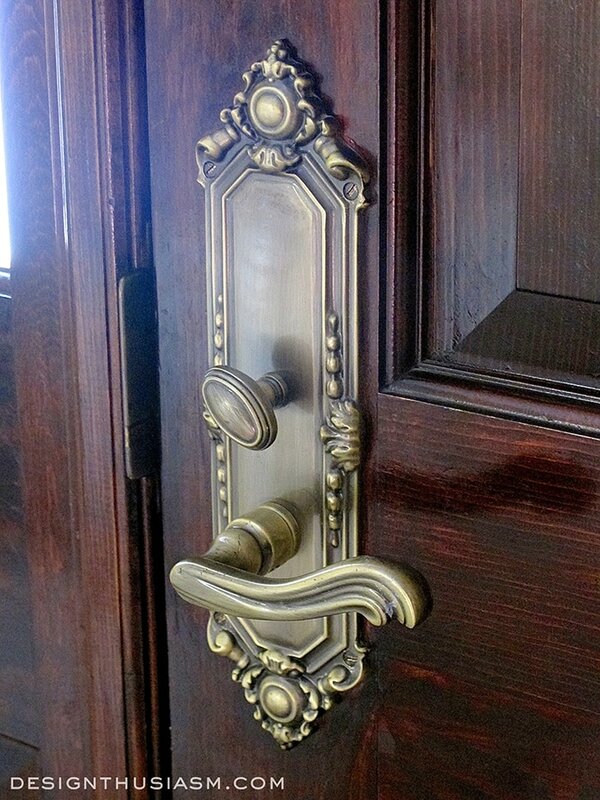 It’s a lovely shape with decorative edging and plays nicely against the mahogany door. This sits directly opposite the entry closets you saw above and reflect the same sensibility. 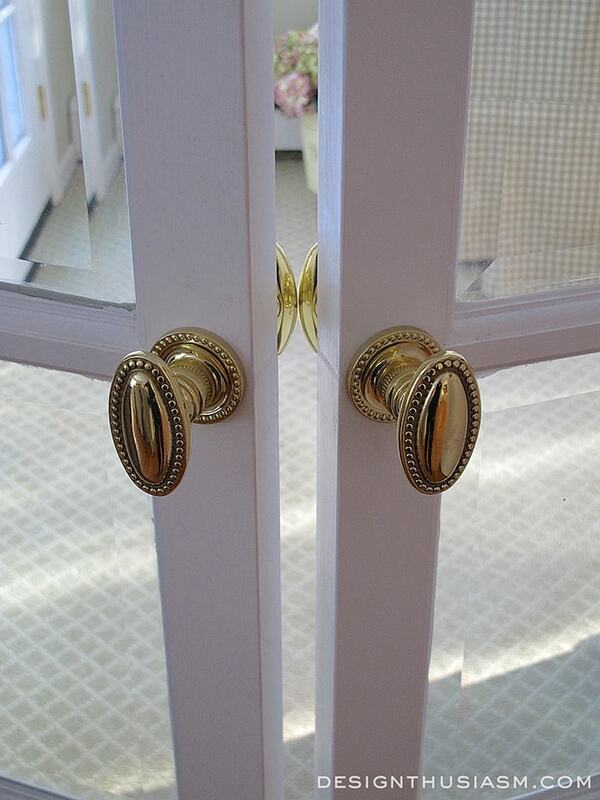 The French doors in our library have beveled glass panes, but I particularly like the bead trim knobs. In the kitchen we added a little towel bar to hold our dish towels in a convenient place. 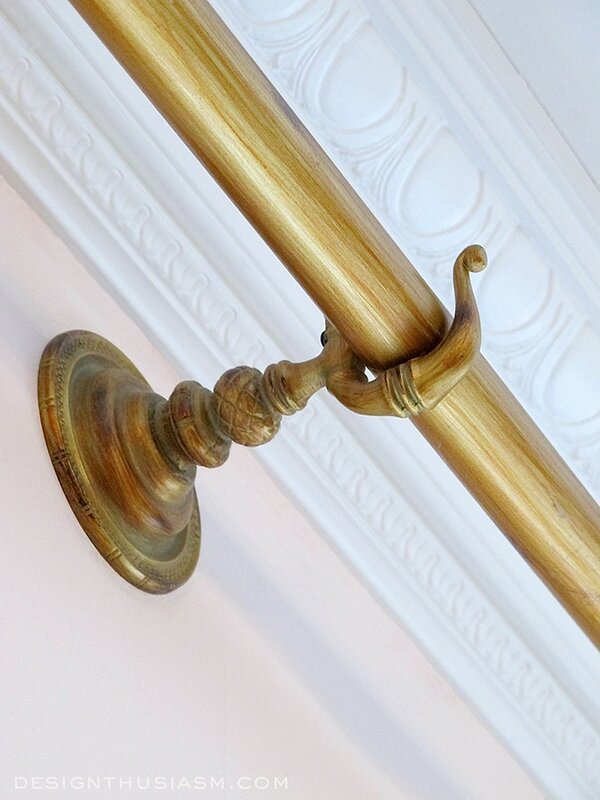 We selected a pineapple finial and ribbed dowel with tiny bits of bead trim. 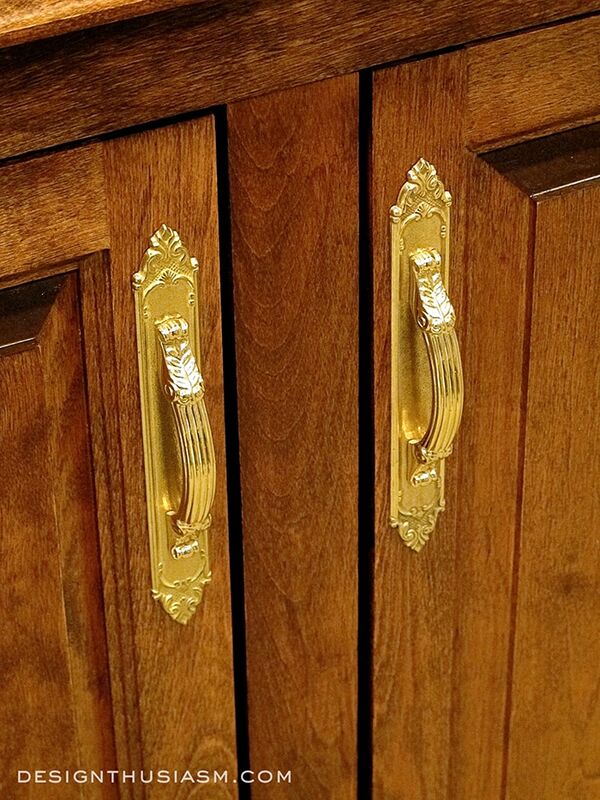 For the door handles on our library cabinets I wanted a pretty brass pull that would contrast against the wood stain. Even this little hook that holds the center of the long drapery rod has a wonderful bit of flourish that’s in keeping with the upgraded details. There’s no end to the details available that can personalize your home. They are the tiny bits of jewelry that add polish to a room and pedigree to a home. 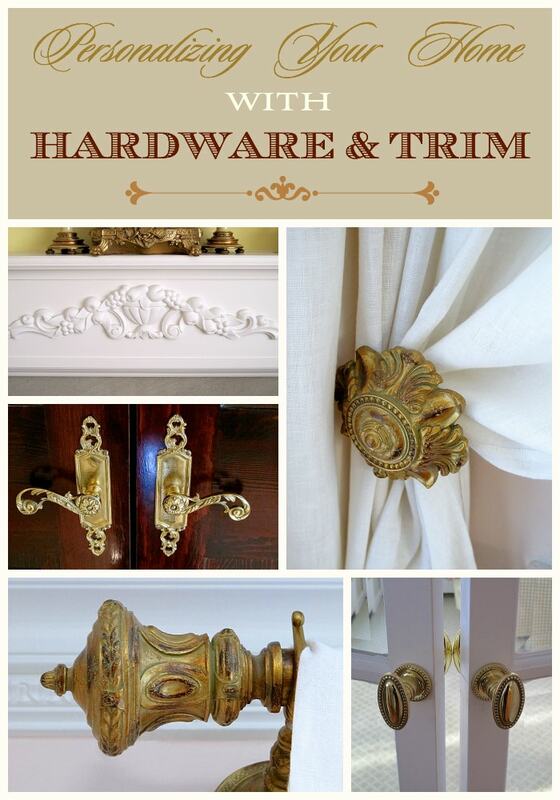 What trim details have you added to your home? These are beautiful accents! (If thats what they are called… not very decorative lingo savvy. Sorry!) But just beautiful! 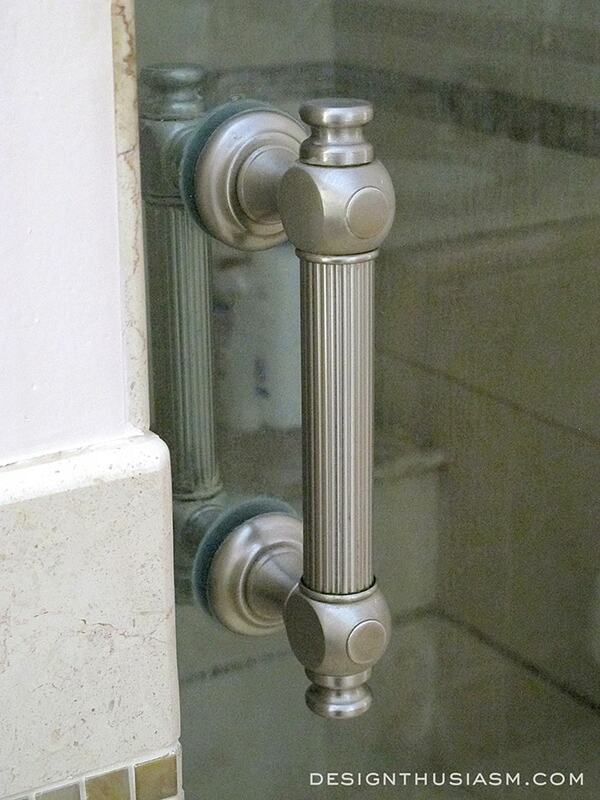 Is there somewhere you typically look to find this type hardware? Maybe a reclaimed salvage store? Thank you Brittany! I actually look anywhere and everywhere. Typically I’ll start searching online. That’s what I did for all the window covering hardware. The shower door handle and kitchen towel bar I found at a local bathroom supplier. Probably would have saved money if I found online! Door hardware I also went to a local supplier in NJ, but you can find at any supplier near you. You want to try to find a company with a big warehouse type showroom where they have lots and lots of choices. I’d love to find reclaimed salvage though!! LOVE those French door handles. 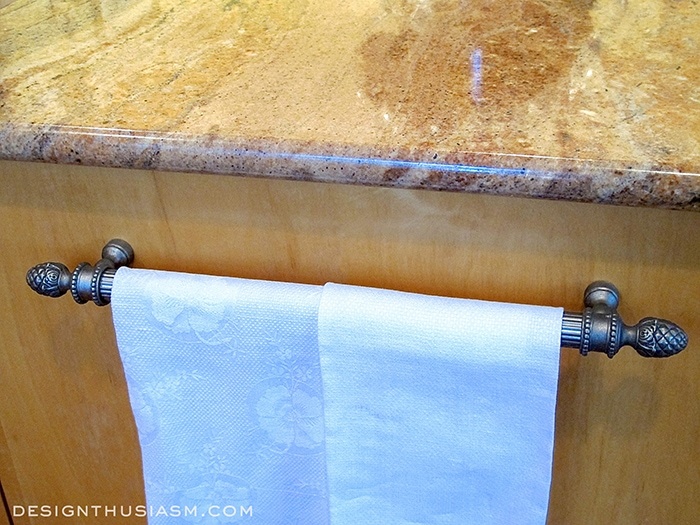 Your kitchen towel bar is exactly what I am looking for. It would match my paper towel holder. I have looked on the Internet. By any chance can you remember the manufacturer’s name or where you purchased it from? This was a great post and suggestions to those of us that live in places without architectural details in the structure. Adding this type of detail is fun. Thank you, Pam! I bought the towel bar at a local bathroom supplier called Bath Connection in NJ, but I will see if I can find the receipt with manufacturer info. Thanks for stopping by!! It’s all in the details! Beautiful hardware! Oh wow, these are all such beautiful ideas and pieces. Love your style. Thanks tons for linking to Inspire Me. 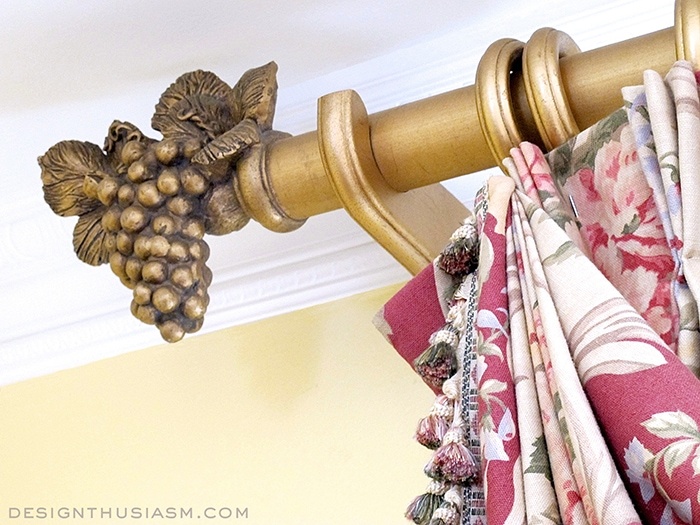 Beautiful drapery hardware. Where did you purchase them, and how did you achieve the finish. Love you’re style. Thank you, Cheryl! I knew someone would ask me the source and I generally try to provide that. Will have to look through my records to find the name of the company. I bought them online and I selected the finish from the company. My DIY skills are limited to design… 😉 I don’t generally do the finishes myself. Wow! Gorgeous hardware, lots of inspiration! I could swear I commented on this awhile ago. Oh well. The hardware is all amazing, and I’m so happy to see your link ups at Best of the Weekend! Oh no… did I link it before? I thought I hadn’t linked up in a few weeks. So sorry if it’s a repeat! But thanks!! 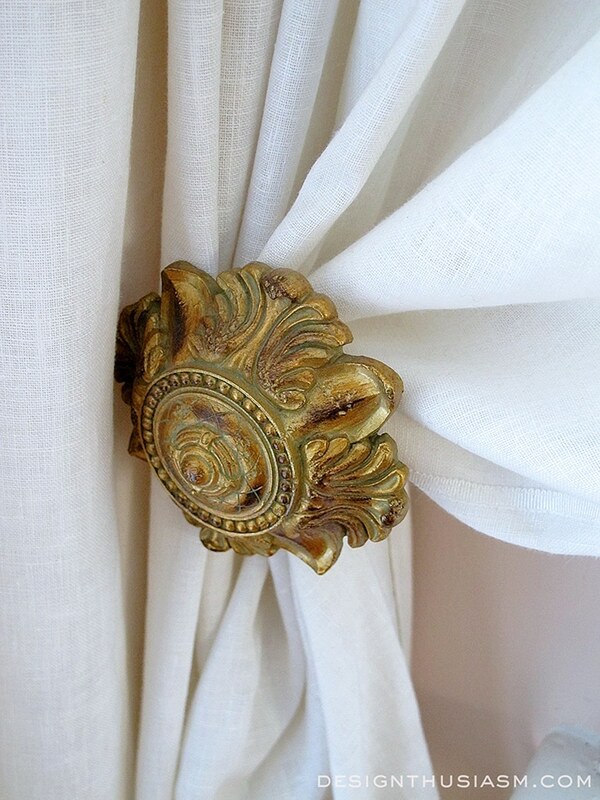 I definitely agree that these details are the jewelry of the room. While I enjoyed seeing these accents, I have to admit to wanting the see shots of the entire rooms! If they are somewhere on your website-please direct me so that I can see all that you have accomplished, (since I am a huge fan of French Country in general) and I suspect, your house in particular! Thanks so much! Actually, there are pics of the rooms all over my site from various different seasons. You can check out this one post of the entryway, which has several of the hardware pieces in it: https://designthusiasm.com/expanded-entry/ There are also several home tours too, one from autumn and one from Christmas. The best way to explore further is to click on the “homestyle” category and there’s an index there. We are moving next month and once we are settled, I’ll start working on a home tour that’s available from the main page. Thanks for visiting! !